Enjoy a tasteful moment with this delicious blueberry and blackcurrant jam preserve! 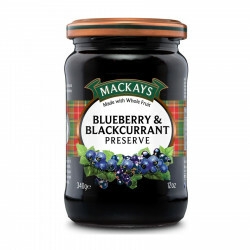 Until 26th November, 50% off when you buy 2 Mackay's jams from this selection. The price reduction will automatically apply on your cart. Enjoy a tasteful moment with this delicious blueberry and blackcurrant jam preserve! A selection of Scottish fruits for a a truly tantalizing delight! Ingredients: sugar cane, glucose syrup, blueberry (17,5%), blackcurrant (17,5%), fruit pectin, lemon juice. 35g whole fruits for 100g - 65g sugar for 100g.